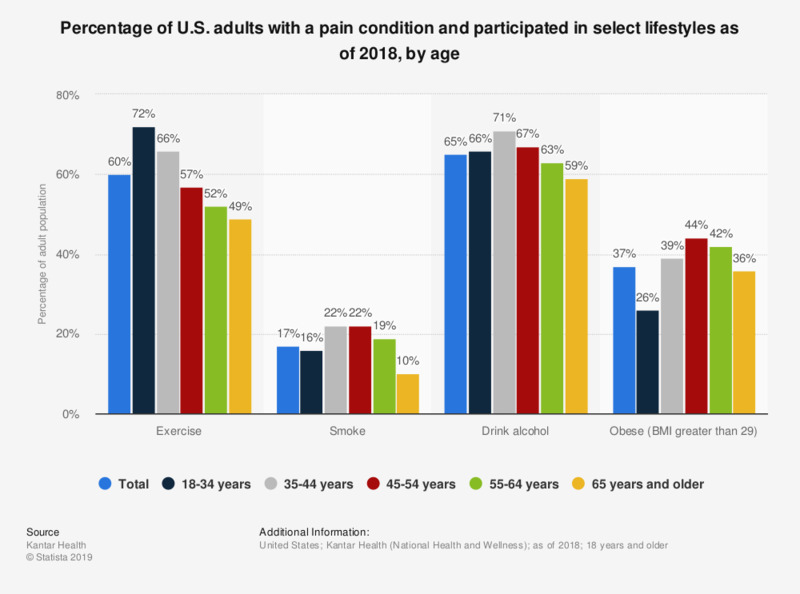 This statistic displays the percentage of U.S. adults who self-reported having a pain condition and participated in select lifestyle habits as of 2018, by age. According to the data, 37 percent of those with a pain condition were obese. Among those who self-reported having a pain condition. Exercise includes at least one day per month of vigorous exercise lasting 20 minutes or more. Pain conditions include the adult population suffering from Arthritis, Back Problems, Bladder Pain, Broken Bones, Cancer, Carpal Tunnel Syndrome, Dental Pain, Diabetic Neuropathic Pain, Fibromyalgia, Headache, Herpes Zoster/ Shingles, Hip/Pelvic Pain, Joint Pain, Lower Back Pain, Menstrual Cycle, Migraine, Neck Pain, Neuropathic Pain, Phantom Limb Pain, Pinched Nerve in Lower Back, Plantar Fasciitis, Post-Herpetic Neuralgia, Shoulder Pain or Stiffness, Spinal Disk, Sprains or Strains, Surgery or Other Medical Procedure, Tendonitis and Other Pain.